Seagate’s latest Ironwolf NAS drives offer industry leading quality at great prices. 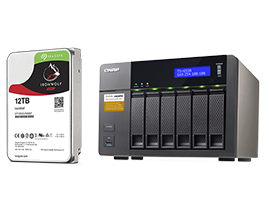 Bring new life to your network attached storage and unleash the full potential of your data. 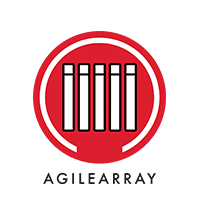 Designed to be always on and always working, Ironwolf is further enhanced with AgileArray™ technology for increased system agility and reliability. Built into every IronWolf NAS drive is Seagate’s own innovative AgileArray™ technology which enables dual-plane balancing and complete RAID optimisation in environments supporting multiple bays. This is an essential ingredient for multi-user environments which demand 24x7 accessibility and snappy, reliable performance. As with any network storage set-up, reliability is needed. 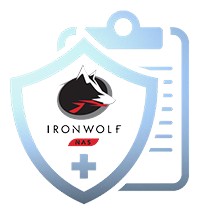 The IronWolf excels in this, using their own Health Management system, Seagate have given you the tools to monitor and manage your drive constantly. Focusing on preventing loss of data and recovery this pushes the boundaries of securing your data. You can also set the drive to notify you if any errors are flagged up in the system with the DiskStation Manager 6.1 included in the software package. This attention to detail is why Seagate are the pinnacle of NAS storage and why the IronWolf will be perfect for you to boost your work rate. Seagate have maximised the potential when in a RAID configuration with Error Recovery Control that redefines responsiveness and combat lag to give a quick, clean user experience where required. 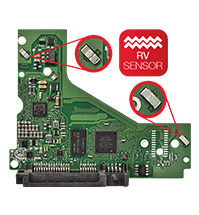 Safeguarding against any kind of loss of data is paramount to Seagate and their RV sensors add another layer of security to the drive. Rotational Vibration sensors manage multi-bay vibration and long term degradation to allow the drive to maintain a consistent performance over a long period of use. Do you have you a question about the Seagate IronWolf (10TB) 3.5 Inch SATA Internal Hard Disk Drive for NAS?